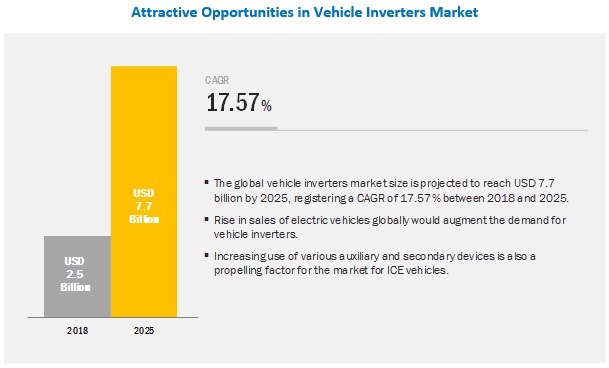 [160 Pages report] The global vehicle inverters market is projected to grow at a CAGR of 17.57% during the forecast period, to reach USD 7.7 billion by 2025 from an estimated USD 2.5 billion in 2018. The automobile industry has witnessed a continuous increase in the integration of various electronic devices in the vehicles. The rising demand for reducing carbon emissions has led to huge innovations and R&D efforts from OEMs and automotive suppliers for the development of components (battery and inverters) and compliance with government regulations. Moreover, the overall weight of the vehicles has increased due to the integration of various electronic features in electric vehicles. The awareness among the consumers, OEMs, and various suppliers along with a push from the government will boost the demand for vehicle inverters in the market. BEV segment is estimated to account for the largest market size during the forecast period. BEV segment is estimated to be the largest market for vehicle inverters market in 2018. The increasing purchasing power of customers and the growing demand for eco-friendly vehicles in emerging and developed countries have contributed to the growth of the market for BEV vehicles. Also, the growing stringency of mandates related to emissions and favorable government policies in several countries has inflated the demand for vehicle inverters. Commercial vehicles segment for ICE vehicles is estimated to account for the largest market size during the forecast period. The increasing use of various auxiliary and secondary devices (such as television sets and coffee makers) during official travel by commercial vehicle drivers has driven the growth of vehicle inverters in the commercial vehicle segment. Also, the vehicle inverters market has witnessed a rising number of innovations due to the growing demand for driver safety and comfort features that increase the durability of the automobile. With the increasing use of various handheld devices (mobile charger, gaming console etc.) and household appliances in vehicles, the demand for vehicle inverters has witnessed an increasing trend in the commercial vehicle segment of ICE vehicles. IGBT-based vehicle inverters are estimated to account for the largest market size during the forecast period. The IGBT is a three terminal (gate, collector, and emitter) full-controlled switch. Its gate/control signal takes place between the gate and emitter and its switch terminals are the drain and emitter. IGBT-based vehicle inverters can withstand high voltages as the newer version of electric vehicles needs to have higher output capacity. The IGBT market is projected to grow due to the growing demand for electric vehicles that require high power efficiency and faster switching capabilities. Thus, driving the growth for IGBT-based vehicle inverters market globally. Asia Pacific region is estimated to account for the largest market size during the forecast period. The Asia Pacific region has emerged as a hub for automobile production and is estimated to be the largest market for vehicle inverters during the forecast period. The growing purchasing power of consumers has triggered the demand for automobiles in the region. Cost advantages for OEMs, low automobile penetration levels, and increased vehicle production offer attractive market opportunities for automobile manufacturers and automotive component suppliers. Also, due to the availability of cheap labor and low production cost, many major OEMs have launched production plants in the region or joined hands with major domestic vehicle manufacturers. The Asia Pacific region is home to key electric vehicles manufacturers such as BYD Auto (China), SAIC Motor (China), and Geely (China). Moreover, it is also home to key suppliers of vehicle inverters such as Denso (Japan), Mitsubishi Electric Corporation (Japan), and Hitachi (Japan). 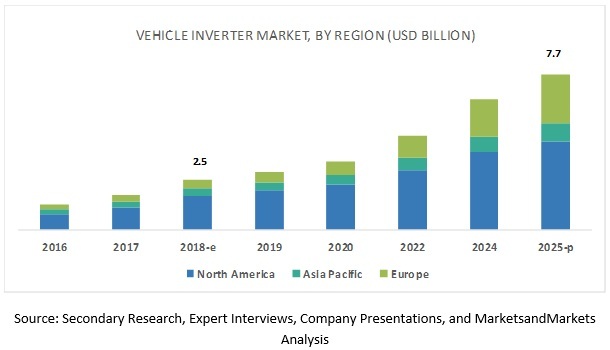 The global vehicle inverters market is dominated by major players such as Denso (Japan), Delphi Technologies (UK), Continental AG (Germany), Robert Bosch GmbH (Germany), and Mitsubishi Electric Corporation (Japan). These companies have strong distribution networks at the global level. In addition, these companies offer an extensive range of products for electric vehicles. The key strategies adopted by these companies to sustain their market position are new product developments, partnerships, and expansions. In October 2018, Valeo Siemens eAutomotive, a joint venture between suppliers Valeo and Siemens, opened a factory in the east China city of Changshu to expand output of high-voltage components for electrified vehicles in China. The plant has 2 production lines for inverters and 1 for electric motors. In September 2018, Hitachi, Ltd. announced the development of an original energy saving power semiconductor structure, TED-MOS, using next-generation Silicon Carbide (SiC) material that contributes to saving energy in Electric Vehicles (EVs). This power semiconductor is a new device using a fin-structured trench MOSFET based on the conventional DMOS-FET, a SiC transistor of power semiconductor. Using this new device, an energy saving of 50% was confirmed. Hitachi intends to apply this device in motor drive inverters, which are a core component of EVs to increase energy efficiency. In September 2018, Delphi Technologies electrification solutions will be developed and manufactured in every region, with new facilities currently being built in Poland and China. Once operational, the Polish facility, located at Blonie, will manufacture DC-DC converters, inverters, and control units. In February 2018, Delphi Technologies, PLC launched the first combined inverter and DC/DC converter (CIDD) in the Chinese market. For automakers, these components create a more efficient and cost-effective solution delivering higher power density, integrated into a smaller and lighter package. In January 2018, Delphi Technologies PLC invested in PolyCharge America, Inc., a start-up established to commercialize a new capacitor technology. This technology helps to make high-power inverters smaller, lighter, and more tolerant to high temperatures. How will electric vehicle sales trend impact the vehicle inverters market in the long term? How will the industry cope with the challenge of compactness and light weight components for vehicle inverters? What is the impact of government regulations and policies on the vehicle inverters market? What are the upcoming trends in the vehicle inverters market? What impact would they make post 2020? What are the key strategies adopted by the top players to increase their revenue? The study involved 4 major activities in estimating the current market size of vehicle inverters. Exhaustive secondary research was done to collect information on the market, the peer market, and the parent market. The next step was to validate these findings, assumptions, and sizing with the industry experts across value chains through primary research. Both top-down and bottom-up approaches were employed to estimate the complete market size. Thereafter, market breakdown and data triangulation were used to estimate the market size of the segments and subsegments. In the secondary research process, various secondary sources such as company annual reports/presentations, press releases, industry association publications [for example, automobile OEMs, Electric Vehicle Association of Asia Pacific (EVAAP), country-level electric vehicle automotive associations and trade organizations, and the Department of Transportation (DOT)], automotive magazine articles, directories, technical handbooks, World Economic Outlook, trade websites, technical articles, and databases (for example, Marklines and Factiva) have been used to identify and collect information useful for an extensive commercial study of the global vehicle inverters market. Extensive primary research has been conducted after acquiring an understanding of the vehicle inverters market scenario through secondary research. Several primary interviews have been conducted with market experts from the demand- and supply-side OEMs (in terms of component supply, country-level government associations, and trade associations) and component manufacturers across 3 major regions, namely, North America, Europe, and Asia Pacific. Approximately 40% and 60% of primary interviews have been conducted from the demand- and supply-side, respectively. Primary data has been collected through questionnaires, emails, and telephonic interviews. In the canvassing of primaries, we have strived to cover various departments within organizations, such as sales, operations, and administration, to provide a holistic viewpoint in our report. After interacting with industry experts, we have also conducted brief sessions with highly experienced independent consultants to reinforce the findings from our primaries. This, along with the in-house subject matter expert’s opinions, has led us to the findings as described in the remainder of this report. Following is the breakdown of primary respondents. After arriving at the overall market size using the market size estimation processes as explained above the market was split into several segments and subsegments. To complete the overall market engineering process and arrive at the exact statistics of each market segment and subsegment, the data triangulation and market breakdown procedures were employed, wherever applicable. The data was triangulated by studying various factors and trends from both, the demand- and supply-sides. Denso (Japan), Delphi Technologies (UK), Continental AG (Germany), Robert Bosch GmbH (Germany), and Mitsubishi Electric Corporation (Japan). Total 20 major players covered. 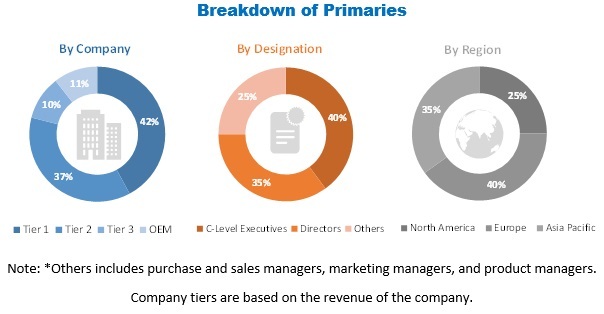 This research report categorizes the vehicle inverters market based on propulsion type, output power, semiconductor materials type, technology type (power module), vehicle type, and region. With the given market data, MarketsandMarkets offers customizations in accordance to the company’s specific needs.